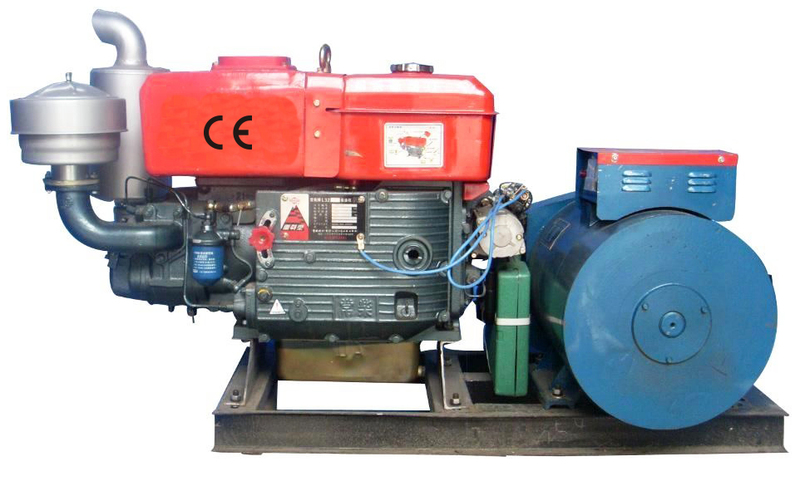 Product categories of Power Generator Set, we are specialized manufacturers from China, Generator Set, Power Generator Set suppliers/factory, wholesale high-quality products of Agricultural Generator Set Machine R & D and manufacturing, we have the perfect after-sales service and technical support. Look forward to your cooperation! Each cylinder performs work in a certain order, and the thrust acting on the piston passes through the connecting rod to become a force that pushes the crankshaft to rotate, thereby driving the crankshaft to rotate. Using the 'electromagnetic induction' principle, the generator outputs an induced electromotive force that is generated by a closed load loop. Only the most basic working principle of the generator set is described here. A range of diesel and generator control, protection devices and circuits are also required to obtain a usable, stable power output. The generator set (English name: Generators Set) is a complete set of mechanical equipment that converts other forms of energy into electrical energy. It consists of a power system, a control system, a noise reduction system, a damping system, and an exhaust system. It is composed of a turbine, a steam turbine, a diesel Engine or the like. The power mechanical drive drives the energy generated by water flow, air flow, fuel combustion or nuclear fission into mechanical energy that is transmitted to the generator, which is then converted into electrical energy by the generator and output to the electrical equipment. Generators have a wide range of uses in industrial and agricultural production, national defense, technology and daily life. In recent years, with the advancement of technology, as a high-quality choice for household emergency power supply and field travel power, lightweight portable small generator sets have begun to enter the daily life of residents.